Do you have aches and pains that you would like relief from? Core Physiotherapy and Pilates Studio have the answers for you! Our physiotherapists combine hands on therapy with a focus on Pilates based core strengthening exercises, tailoring a Pilates program to suit the individual needs of our clients. Our studios contain specific Pilates equipment that utilise spring resistance and pulleys to help correct posture, as well as retraining correct movement patterns. Here are our top 5 Pilates mat exercises that will help you to strengthen your ‘core’! This exercise earnt its entertaining name because when you practice it, you look like a dead bug lying on its back with its legs in the air! Dead bug involves opposite arm and leg extension movements, switching on your oblique abdominal muscles (located at the bottom of your rib cage) whilst your deep core muscles (located at the base of your spine & lower tummy) keep your pelvis and back in a neutral position. This teaches you to isolate movement at your hips and shoulders without moving your spine, reducing the amount of pressure that you put on your lower back. This is a fantastic exercise for people with lower back issues. 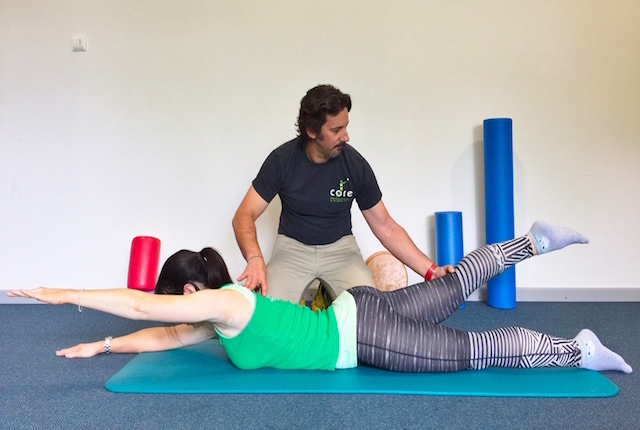 This core strengthening exercise is great for people with back, hip and knee pain, whilst also tightening your buns and legs! When you perform this exercise you roll your pelvis off the mat and keep articulating up until there is a straight line from your knees to your shoulders. From there, you reverse your spine rolling down until you are back on the mat. Bridging strengthens your middle and lower spine, this helps you to stand up straighter, relieving back pain and improving your posture. Whilst your lower back is raised lifting your leg towards the ceiling challenges your core and hip strength. Don’t be fooled, this exercise isn’t as easy as it looks! When you practice the ‘all fours arm and leg lift’ it switches on your core muscles at the back of your spine, as well as making you work your hip and shoulder stabilisers. The aim of the exercise is to keep your body still in the all fours position whilst you stretch your arm and leg out. This Pilates exercise helps you to improve core muscle strength across the back of the whole body from your arms, shoulders and upper back, through to your lower back, hips and legs. Working the oblique posterior core and back muscles, when you perform this exercise make sure that you keep your lower stomach muscles switched on to support your back whilst you exercise. Keeping your hips and side lying body position still is the challenge to the Pilates ‘clam’ exercise. Your hip stabilising muscles are activated raising your knee whilst your foot remains on the ground. This exercise strengthens your hips and thighs, whilst stabilising your pelvic muscles and toning your glutes. Please take into consideration that these exercises need to be done under the supervision of a trained Pilates instructor or Physiotherapist. These exercises should never be painful, if they are stop them straight away and consult a health care professional. To find out more or to book your appointment at one of our 14 convenient Adelaide locations go to corephysio.com.au. Follow Core Physiotherapy & Pilates Studio on their FACEBOOK + INSTAGRAM + TWITTER and WEBSITE. Previous PostXMAS GIVEAWAY: WIN 2 KYTONS BAKERY GOURMET HAMPERS AND 2 XMAS GOODIE BAGS! Next PostXMAS GIVEAWAY: WIN A PERSONALISED DOUBLE WICK GOLD CANDLE THANKS TO GREETING CANDLE CO!